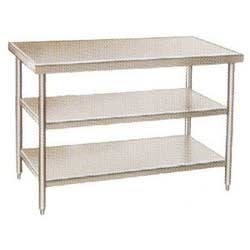 With the constant support of our expert team, we are engaged in offering a huge assortment of Work Table with 2 under Shelf. The unit's top fabricated out of 16 SWG 304 grade SS sheet and two under shelf in 18 SWG 304 grade SS sheet. The unit mounted on heavy duty SS pipe with adjustable nylon bullet leg. The unit is offered accordingly to the client’s specification. 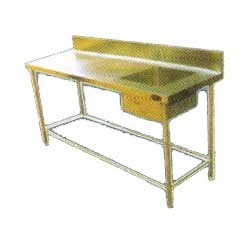 Banking on our enriched industry experience, we are engaged in offering a huge gamut of Work Table with Sink. This work tabletop is made out of heavy gauge stainless with optional splashguard with or without sink and optional drawers. The worktables are perfect for multipurpose. These are used at hotels, restaurants, industrial canteens and fast food centers. They are easy to install and are also cost effective. Banking on our enriched industry experience, we are engaged in offering a huge gamut of Work Table with Sink and 1 under Shelf. 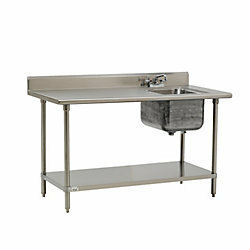 Our company is highly acclaimed in offering a wide range of Work Table with Sink and 1 under Shelf. 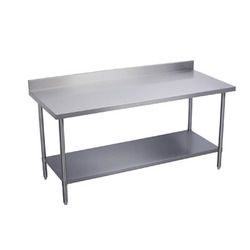 This high grade Work Table with Sink and 1 under Shelf is widely demanded in the international markets for its high durability, optimum performance and reliability. Looking for Work Tables ?